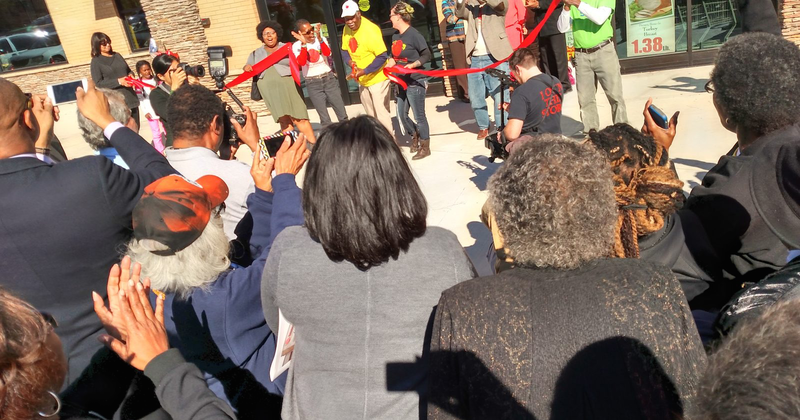 When the Renaissance Community Cooperative opened its doors this fall, it brought back a grocery store to a community that had been without one for eighteen years. The new store in this Greensboro, North Carolina neighborhood is the culmination of a nearly two decades-long saga that began in 1998 when Winn Dixie closed its supermarket on the site. With that store’s closing, the neighborhood officially became a “food desert” and residents, including hundreds of people living in nearby public housing, were left without access to healthy and affordable food. According to the Food Research & Action Center, Greensboro is among the most food-insecure areas in the country. After city efforts failed to recruit a new grocery chain to the area, frustrated residents decided to take matters into their own hands and began organizing a community-owned cooperative grocery store. With the steadfast commitment of local residents and support from Greensboro-based Fund for Democratic Communities, organizers pressed passed obstacles and naysayers. Shared Capital stepped up to approve financing to the project in 2015. That early commitment helped bring other resources to the table. The site was redeveloped by North Carolina-based, Self-Help Credit Union, which is leasing the space to the co-op. Shared Capital has provided $480,000 as the senior lender for the project, and additional financing came from The Working World and Regenerative Finance. Residents see the new Renaissance Community Cooperative as more than just a grocery store. It is part of a three-pronged solution to the community’s needs: improving food access, building economic opportunity and encouraging community collaboration. Volcy notes, “The store is gorgeous and there is such a sense of community pride when you walk down the aisles.” (Made in Greensboro, 12/14/16).